Leaving From Brisbane on your Fraser Island 4WD Tour (or your pre-arranged pickup point) we drive North towards Rainbow Beach, passing by The Glasshouse Mountains. Shortly after exiting the highway we head towards Noosa to jump on the beach for a complimentary tour of Tee-ware Beach (Noosa North shore), Double Island Point & the iconic coloured sands of Rainbow Beach. Once arriving at Rainbow Beach we will stop for a lunch break with time to go for a swim or a quick walk around town at your leisure. After the lunch break, we will load up and head to Inskip Point where we board the ferry to cruise across to Fraser Island. 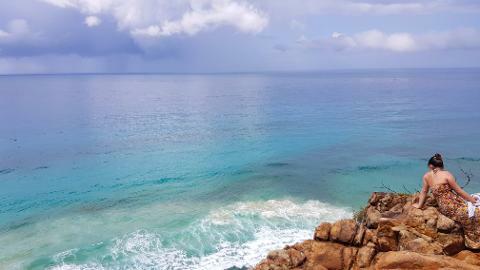 Make sure you keep an eye out for dolphins, dugong, sharks, turtles, & whales (in season). 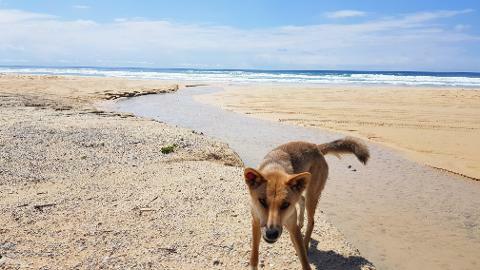 Arriving on the southern end of Fraser Island, this is where the real fun begins! As we 4WD along 75 Mile Beach, the beautiful white sands are sure to take your breath away and leave you in total awe! Reaching the campgrounds (our accommodation for the next few days), we unload the gear and get set up for what is sure to be 3 days you will never forget. After unloading the vehicle we head to Lake Mckenzie with plenty of time to take a swim and sunbake on the beach. Just kick back and relax on the pristine white sand (an absolute must do Insta pic). After drying off we head to Central Station. 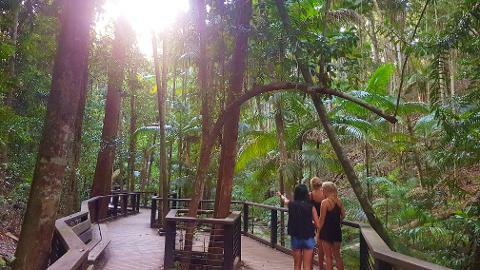 Central Station is the only tropical Rainforest to grow out of sand anywhere in the world! 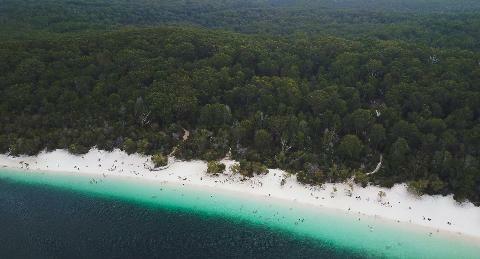 Experience the unique Australia World Heritage Satinay Forest & be amazed by the rare giant King Fern and the crystal clear waters of Wanggoolba Creek. The water here is so clean if it wasn’t flowing you wouldn’t think there was any water in it at all! After central station we will head back to camp with time to relax before a BBQ dinner. After dinner, you can choose to kick back around a campfire or walk down to the beach and star gaze before the next day of excitement begins! After waking up we will have breakfast at camp before 4WDing along 75 Mile Beach, heading up to Champagne Pools. Along the way, we will stop and explore SS Maheno (a shipwrecked old passenger ferry that was used as a hospital ship during WWI). 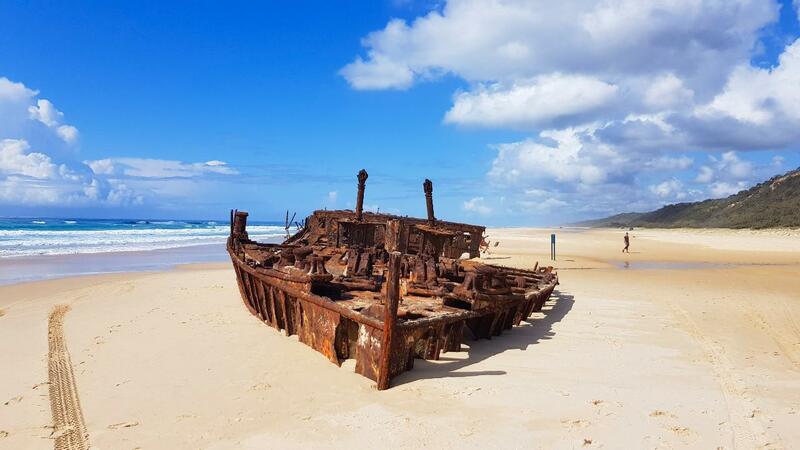 This ship has been sitting on 75 Mile Beach since 1935. A true wonder of Australian history! Arriving at Champagne Pools there will be time for a swim and to sunbake before heading to Indian Head. Indian Head is a great spot to see dolphins, sharks, turtles & whales (in season) but first, we will need to climb to the top. This is one of the few rocky outcrops on the island. With breathtaking views, we will stop for a group photo and a few selfies before heading to Eli Creek. 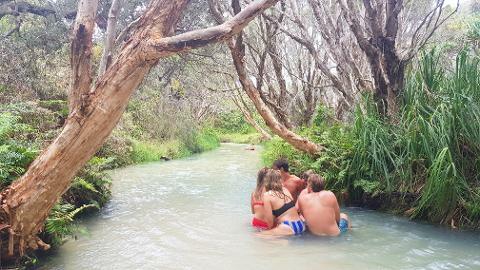 Arriving at Eli Creek you can choose to relax on the beach, play a ball game with friends or float down the creek on a floaty with your bestie. After Eli Creek we will head back to camp where you will have time to freshen up with a nice hot shower before dinner. We start the morning off with breakfast before packing everything and loading it into the 4X4. Once we are all loaded we will 4WD to Lake Wabby, the deepest freshwater lake on Fraser Island. 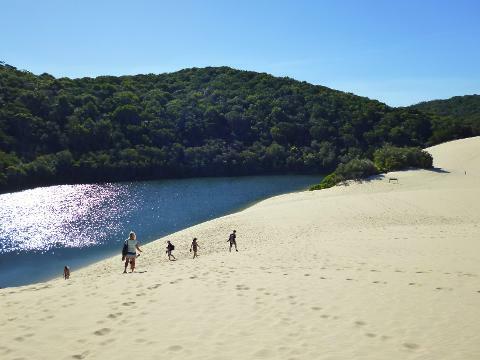 This magnificent emerald green lake is surrounded by native Eucalypt Forest & a massive Sand Blow with time to take photos, have a swim, work on your tan, spot turtles and fish or build a sand castle before walking back to the 4WD. After Lake Wabby we will travel South along 75 Mile Beach to the ferry crossing where we will depart Fraser Island and head back to Rainbow Beach. If tide permits we will use Rainbow Beach as our highway departing the beach at Tewantin (Noosa), before heading back to Brisbane to drop you off. Day 1: Lunch – Picnic lunch & cold drinks at Rainbow Beach; Dinner – BBQ dinner with fresh salad & cold drinks after dinner, marshmallows around the camp fire. Day 2: Breakfast – Tea & coffee, cereal, toast, fruit, bacon & eggs; Lunch – Salad rolls with your choice of fresh meats, cold drinks & fruit; Dinner – BBQ dinner with fresh salad & cold drinks.